Continuing the ongoing series of interviews with creative artists working on various aspects of movie and TV productions, it is my absolute delight to welcome Natasha Braier. In this interview we talk about the art and craft of cinematography, the hierarchical structure of feature film productions and how that structure still lends itself to predominantly male voices, and the pleasure and pain of working long hours over months at a time. The second half of the interview is on Natasha’s work on the meticulously crafted “The Neon Demon”, an engrossing story of a young girl taking her first steps as a fashion model in the wild urban jungle of Los Angeles. 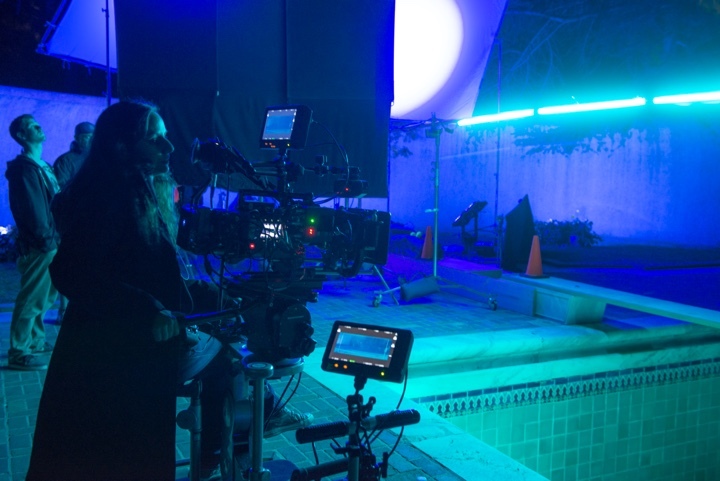 Natasha Braier on the set of “The Neon Demon”. Courtesy of Natasha Braier. Natasha: I was doing still photography when I was a teenager. It was mostly black-and-white, developing them in my own dark room. The first time I looked at the end credits of a movie and saw the title of director of photography was when I was nineteen. I was immediately interested in that, and some of my older friends who I studied photography with had chosen to go to film school. It was through them that I discovered that world and the role of a cinematographer. That’s when I decided to go to film school myself. Kirill: Do you remember being surprised at anything in particular when you started there, when you saw how things worked behind the camera? Natasha: I wouldn’t say that I had big surprises. There were a lot of things to learn that were different from the world of still photography. If there’s anything that I didn’t know at the time I made the decision to go to the school and go down this career path, I’d say that I didn’t know that it would be such an intense commitment. You barely have time to have a life, and I didn’t know that I was going to spend so much time traveling and working away from home. Also, I didn’t know that you could make so much money as a cinematographer. That was a nice surprise. I thought that I was going to be a humble artist doing what I love, much like other artists that I saw in my life. It was a good surprise that I get to travel the world and see all the exotic places, and make money. And the other surprise was that if you want to be home for a few months, that’s difficult. Kirill: Looking back to when you were in school, what happened to people that went to that school with you? Are most of them still in the field, or do some leave it as years pass by? Natasha: I went to a couple of film schools because I was moving with my family. I only stayed a few months in Argentina and another few months in Spain, and then I spent three years getting a master’s degree in cinematography in England. That’s the only education that I completed end to end. That program was very selective, accepting only six people every year for each field. The other five that started studying cinematography with me that year were older than me, in their late twenties and thirties. Some had been camera assistants before, and they were really committed to this work. It was difficult to get into that school, and once you got in, you continued afterwards in the industry. Some had more success than others, but all of them are still working in the field. Kirill: As you said, your job is quite intense, and you spend long months away from your family and friends, and long hours on set once the shooting starts. If we’re talking about you, what makes you stay in your field? Natasha: It’s a great job and I love doing it. It comes with a cost, and otherwise it would have been a paradise. You pay a price. You have your freedom – you don’t go to the same job every day, you don’t have a boss, you get to choose your projects, you get to travel and meet different people. And the price you’re paying for that freedom and flexibility is that you don’t always know what you’re doing next month. I think the world is divided into people that can live with that and people who need a stable life and a stable job. If you’re not the former, you will probably not stay in film industry. If you talk about people in the industry, we are not very normal [laughs]. We need the adrenaline and the highs. It’s like being on a rollercoaster. You have your ups and downs. That’s the challenging part of the work. Over the years I’ve learned to deal with that in better ways, to not get so anxious about what I was going to do next, and to trust that there’s always something coming. I started enjoying the moments when I’m working a lot more, and to stop worrying about what’s next. It’s also a big spiritual test where you need to learn a lot about patience and not having control over what’s next. Kirill: What about being on the set with so many people around you, and adjusting to new interactions on each new production that you join? Do you need a degree in psychology, so to speak, to find the common language? Natasha: Yes, you have to be a psychologist to choose the right people to work with, and that happens very fast. You read people and try to find those that don’t create a lot of ego conflict. Then, when you’re on the set, you’re dealing with a lot of people as well. Some of them were chosen by you, and some of them were not. Sometimes you make mistakes, and you have to deal with a lot of different human behaviors. I found it very useful to study psychology [laughs] and to do a lot of workshops that have to do with human behavior and personal growth. I acquired a lot of tools to deal with different personality types, some of them quite eccentric. Kirill: I’d imagine that it comes with the job when you have so many talented people working together for a very intense stretch of time. Natasha: You have to learn to manage your own ego and emotions, and manage how you deal with other people’s egos and emotions. Being a woman in my position, I work with a crew that is 99% men. I need to own my authority from a place where I am who I am. That means that I’m using my feminine energy instead of trying to compete with strong testosterone. Sometimes it is very complicated – being a boss of a lot of men that come from a variety of physical backgrounds, like being in the army, driving trucks and other physical work. Most of the crew is great, but some have issues having a woman as a boss and me telling them how things need to be done. There is a lot of learning that I have to do in how to navigate those situations, how to gain their respect and how to maintain my authority without becoming authoritarian or getting into battles. There is an hierarchy and a protocol already established in the film industry over the last hundred years. It is very similar to the military structure, and when the captain of the ship is a man, the dynamics just automatically works. But you put a woman there, and a lot of things that are taken for granted suddenly are questioned. You have to earn that place, whereas as a male, you wouldn’t almost have to do anything. Kirill: And it takes a long time to change things like that. Humans learn by observing and imitating, so as a student you go on the set and you take what you like from a cinematographer style and way of running the set, and copy some of his behaviors still you find your own. But the reality is that when the cinematographer is a woman, the dynamics on the set is totally different, and you don’t have an instruction manual. You don’t have a lot of people to look at and learn, because we are only 2% doing this job. I had to learn from my own experience over the years. Kirill: Do you think that such an imbalance at various levels of the hierarchy skews the stories that are told towards male audiences? Or perhaps diminishes the impact of some stories that would be best told from a more balanced point of view? Natasha: I don’t know if it’s about the stories, because those are universal. There are great male directors that are telling “female” stories, and the other way around. But I think that the human approach is different, and it definitely feels different on the set. I’m sure it is seen in the final result as well. It is such a male-oriented environment, in part because of the way the system works. It is so linked to the patriarchal capitalist model where everything is about money. You shoot five scenes that are in the same location at different moments of the movie, and you’re doing it on the same day because it’s cheaper to come there once. Even if that film crew was 50% women, the context in which films are made is patriarchal. Even if you have women there, we’re adapting to that system. Of course we’re bringing our sensibility, but it doesn’t mean that things are being made with a different energy. I guess if we were really to do films with a feminine mind, things might be more organic, we would shoot scenes chronologically, do fewer hours a day and rest more. That world would be very different. You would also need daycare for the babies if you have that many women on the job and not all of them can afford a nanny for that many hours. You would have a crèche with the babies next to the set, and long lunches. It would be totally different and less cost-effective, may be. Or may be not; may be we would figure a way to still make it cost effective. We don’t know how different the results would be. You can’t really talk about better or worse. It would be different. When I shot with Nicolas Refn, we did it chronologically because that’s the way he works. And there are a lot of compromises around it to enable him to shoot that way. I think the whole experience is completely different, and that it makes a huge impact on the final result. I can imagine if women were having it their way, were reconnecting with their instincts and the way they would do it, there could be something interesting around that process. That could bring very interesting results, and it would also bring good movies. It would be interesting to open up our minds. Kirill: Do you think that your field is more open now for more voices to join it? There are so many indie features being made in the last few years, some of it on really low budgets. It might be connected to the progress of technology and availability of affordable equipment for the younger generation of storytellers. Natasha: You can now shoot on your iPhone and edit on the computer. People are getting more proficient with this programs, and the programs are very intuitive to use. If you want to do a short film when you’re eighteen, you don’t need to go to a film school. Kirill: Is it good for the industry to have that many more movies that are made and stories that are told, even if not all of them are at the same quality level? Natasha: The word “industry” to me is strongly linked with the economy. But is it good for the art of cinema? Is it good for human beings to have more people that are able to express themselves through movies? Yes, of course. People can express their life experiences and share them with others. I think we all become richer through that. Kirill: “The Neon Demon” was financed by Amazon, Netflix is doing so many original productions, and there’s a lot of longer-format storytelling on cable channels. Sometimes it feels that instead of choosing what to watch, I have to choose what I don’t have time to watch. What is your experience these days as a viewer? Natasha: I’m a special case. I live up in the mountain, and I when I’m not filming or reading scripts or taking photos, I’m meditating. I watch movies, but I don’t watch any TV shows. I don’t have time. When everybody is saying that some TV show is amazing and that I have to watch it, I don’t even start. If I watch two episodes, and it’s really that good, it will get addictive and I’ll have to watch the whole thing and barely sleep until I’m done. I try to stay away from it. I don’t want to know, because life is too short. I’m staying old-school and only watching movies. Kirill: Can you talk about the initial phases of joining the production of “The Neon Demon”? Natasha: I had a meeting with Nicolas, which was the first time I’ve met him. He sent me the script, and during that meeting he explained what he was interested in conceptually. We talked about movies we loved, art, being foreigners in LA and a lot of other things. We talked about the movie and its general themes, and we were totally on the same page. There were some things in the script that I didn’t like that much. It had some characters that I didn’t like, and a lot of dialogue, and things that didn’t seem like him at all. It was really weird because we were talking about the movie that he wanted to do, and it was so different from what I’ve read in the script. And then he said “Which script do you have?” and it turned out that I had a fake script. He told me that he would send me the real script, and I asked him what was the movie actually about. He said that was about the same themes, but the script was very different because he doesn’t like to give his scripts away. I started driving home, and while I was still on the freeway, I got a phone call from my agent saying that Nicolas offered me the job. Well, that was great, but I haven’t read the real script yet [laughs]. Nicolas said that he was working on a new draft and that he’d be sending it over in a week. So I had to decide if I would take that job without reading the real script, because he was not going to wait until then. It was such a beautiful conversation that we’ve had, and I could see that we were on the same page. So for the first time in my life I’ve said yes to a movie without reading the script, . It was a leap of faith, but it was totally right. When I got the real script I loved it. We had two months, looking at a lot of locations together, talking about the characters and the emotional landscapes. Kirill: Usually, how deep does a script go into the visuals? Is it all about the dialogue, or are there instructions on angles? Natasha: It doesn’t describe the angles, because you find that on location. Usually the script has even more dialogue than what we end up having in the final cut, because people need to understand it. In the movie, Nicolas uses visual language and visual poetry to communicate ideas. You can’t do that at the script level because it’s written and you don’t have the visuals and the angles there. Even if you knew the shots you wanted, you can’t really write all of that down. You have to be more literal in the script so that everyone gets it. Then when he has the actors on the set, he cuts the dialogue down to 10% of what was in the script, and we find a way to say the same things with images. That’s the interesting part of my job. Kirill: When do you start thinking about the angles of your takes? Does that happen during pre-production, or is it flowing more organically on the sets? Natasha: We go to locations and take photos to create a storyboard of angles that we like and where we’re thinking the characters should go. Then, on the day when we try it with the actors, Nicolas is very open-minded to see what works. Sometimes the previous ideas work and you just refine them, and sometimes you change them completely because it doesn’t really make any sense. We shot chronologically, and the process was very organic. It was easy to see what worked and what didn’t. And it was easy to change things because you haven’t yet shot the next scene. You can flow with it. Kirill: Does it make things easier for you when you’re not jumping back and forth in the timeline of the story? Natasha: It makes things a lot easier for me. It makes it more tricky for my electricians and grips, because they have to light the same location however many time we go back to it. It would be cheaper and faster to do it on the same night, but that doesn’t mean that it would be better for Nicolas and the actors. It’s better to go chronologically from the creative point of view. When I revisited that hotel, every time I came to it with the feelings and the mood that I got from the journey so far. And it was the same for the actors. You know where you’re coming from. You just shot it a few hours before or maybe yesterday. It’s harder to do all of that on the same day when you haven’t experienced that journey. Its nature is very different. When you do things chronologically, you don’t have to calculate so much. You can live through that experience and be more emotional. You are inside that movie. Kirill: What are your thoughts on video monitors? Does it help that everybody on the set can immediately see what the camera is capturing without waiting for the dailies? Natasha: It’s good that the director can see so that you can have a very direct dialogue and there are no surprises. In the good old times, when I was shooting on film I used to take stills on set to show the directors how dark I was exposing, as there was no way back. Now I don’t need to take photos and grade them anymore. I can get a good DIT [digital imaging technician] that is controlling the settings and the monitor so that the director can see something that is very close to what would be captured by the camera, and that’s great because I want to do as much as I can in camera. In that sense, it’s very good to have monitors. As for the rest of the team, I’d rather prefer that they didn’t look at the monitors. People that need to be looking at the monitors to do their job usually do not look. And the ones that don’t need to be looking are making comments that may be distracting, adding more voices than you need on the set. Kirill: You shot “The Neon Demon” on digital, and while there were a few sequences in broad daylight, it felt like most of the movie was spent in the dark, in the shadows. Do you think that it would be possible to shoot such a movie 5-10 years ago with digital cameras that were available back then? Natasha: Digital is still not as good as film. I would have loved to do this movie on film, but there was no way to convince Nicolas. It was my first movie in digital. You could have done the same on film, and it would have been even more beautiful. It would have had the organic texture, and the magic that only film has. As to your question, I wouldn’t do this film on digital ten years ago. Digital cameras back then were nowhere close to what we have these days with Alexa. I just managed to do some things with Alexa that to me look almost filmic. I would not have shot this film with Red ten years ago. Kirill: When you say that you would have loved to shoot this on film, is it a subjective or an objective choice? Is digital still trailing behind film as far as the technical capabilities of capturing the image? Natasha: It is my subjective opinion, but it is also the subjective opinion of most of cinematographers in the world. I guess you can also call it objective. It is very sad to see film being pushed out and being replaced with digital. Kirill: Did you stay through the post-production, as the movie was edited and color-graded? Natasha: I didn’t stay for editing, as the director of photography is usually not present during that phase. I did color correcting with Nicolas over a couple of weeks, and I also supervised color on some special effects. Kirill: There were a couple of sequences with strobing lights, one at the first party, and the second during the fashion show. Was that captured in camera or done in post-production? Natasha: All the flashes were captured in camera, as well as most of the flares. Nicolas wanted to add more flares to those two particular scenes to enhance it even more. So he grabbed some of the real flares that I created, and pasted them to create more. But all the strobes were captured in camera. Kirill: Was there any complexity in the catwalk sequence setup when we see three “faces” of the main character at the same time? Natasha: We’ve built a mirror entrance door, with two walls and mirrors to have her reflected in them. Kirill: Was it exciting for you as a cinematographer to play with so many colors on one movie? It felt like “The Neon Demon” explored the entire rainbow. Natasha: We didn’t do the entire rainbow. It was a limited color palette, but a very intense one. It was mostly reds, turquoise blues, magentas and violets. There was a bit of cyanish green in the motel at night. There was no yellow and no orange. It was all captured in camera. We didn’t add any colors in post-production. There was minimal color correction, adding a bit more contrast or brightness. That’s the same way that you could play in the lab in the old times when you were shooting negative. Maybe we had a few shots that required making a mask and fix a few things, but all the extreme colors, lights and shadows were all in camera. That’s the fun of it. Kirill: What are your thoughts on the capabilities of those digital tools that are used in post-production? Might it be a lazy choice sometimes to not do things during the principal shooting? Natasha: The choice of making it in post could be lazy in some cases. It could be safe in others. People try to save time and money on the set, and prefer to spend that money in post. There is no single approach that works for all cases. I grew up doing everything in camera, and that’s the way I like to do it. Sometimes you are present during post-production, and sometimes you’re not. The more you do in camera, the more you guarantee that things will look the way that you intended them to. I prefer that everything is already there, and that they can’t change it too much in post. Kirill: What is your approach to filming emotionally charged scenes? How do you minimize the distractions your equipment and crew create for the actors? Natasha: Every situation is different. Mostly you try to be ready before the actors walk in. Once they are in their emotional state, you can’t interrupt them. I try to light as much as I can from the outside. You keep it as simple as possible, and keep disruptions to absolute minimum. The timing is very delicate. Kirill: You are there working on a production for however many months it takes. You know the script inside and out, you know every set and you’ve filmed every scene multiple times. Can you enjoy the movie when it’s out in the theaters and you go to the premiere? Natasha: When you see the first cut, it’s always work in progress. Even the last cut doesn’t have the sound or the color correction or the music. You’re not really experiencing the final movie. It’s also very hard to watch it as if it was your first time. You’ve created every frame, and you keep track of what they took out. But it doesn’t mean that you don’t enjoy it. The first time I saw “The Neon Demon” when I arrived for color correction, I really enjoyed it even if wasn’t experiencing it as an audience for the first time. I saw the screening of the finished movie in LA, and then I saw it in Cannes. I think it was the third time when I saw the premiere in LA where I felt that I really watched it. I could see it without thinking about all that other stuff. Sometimes it takes a long time. It might take a few years even. I did “Glue” back in 2004 and it’s been a while since I’ve watched it last. A lot of the details around it have washed away when I think about it now, but I’m sure some of it would come back if I watch it again. It’s impossible to separate a movie from your experience of shooting it. How can you do that? The further away you are from the experience of filming it, the closer to the final result you get. But you’re never as fully detached as somebody who was not involved in making it. Kirill: I think that even for myself as a viewer, watching a movie more than once is simply a different experience. Even though I know exactly what is going to happen, I notice details that I’ve missed or pick up hints that connect early parts of it to what happens later. Every time it’s a different texture of the same story. Natasha: And every time you watch it, you’re experiencing something different. When I watched that premiere in LA, I could really appreciate the soundtrack. I could really hear everything, because there was more space in my brain. I’ve seen everything that I had to see about my stuff the first two times. And I’m sure that the next time I’m going to watch it, I’ll see details that I haven’t seen before. And here I’d like to thank Natasha Braier for graciously agreeing to answer a few questions I had on the craft of cinematography and on what went into creating the amazing world of “The Neon Demon”. The movie is out now on BluRay and other physical and digital formats. Finally, if you want to know more about how films and TV shows are made, click here for additional in-depth interviews in this series.